When I first made my transition into clean beauty in 2007, one of the first brands I explored was NOW Solutions. They offered a great range of carrier oils, essential oils, clays and other natural skincare staples that got me hooked on going green. It was so easy to find whatever I wanted and get to DIY-ing. Today, though, NOW Solutions boasts an even more impressive collection of natural beauty products — beyond base ingredients — that have piqued my interest. They’re cruelty-free, and many are gluten-free, vegan and contain certified organic ingredients. Whether you’re restocking some of your favorite certified organic staples or interested in trying out a new scrub or toner, it’s time to #NOWBeBeautiful, because green beauty products have never been more accessible. 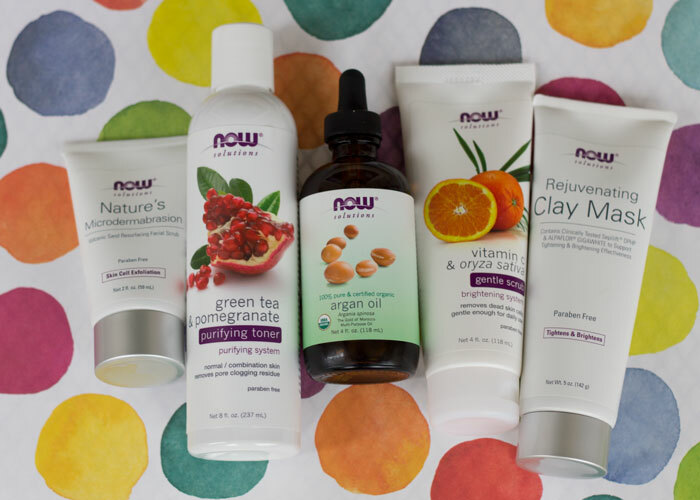 Below are my picks from the NOW Solutions Organic Home Beauty & Personal Care collection — and, you guessed it, what one lucky reader will win as well! Extracts of arnica, aloe and cucumber in combination with vitamin E balance the skin while providing a final, deep pore cleansing post-wash.
Vitamin C, niacin and aloe gently unclog pores to reveal brighter, more even skin. Rice bran beads naturally exfoliate without feeling harsh or abrasive. With the fine grit of volcanic sand, Nature’s Microdermabrasion restores and refines the skin while adding a shot of vitamin C to protect and mega doses of squalene, extra virgin olive oil and avocado oil to moisturize. Packed with hyaluronic acid, vitamin C and aloe, the Rejuvenating Clay mask deep cleanses without overdrying the skin. The convenient squeeze tube makes it a breeze to get in your weekly clay mask. Expeller pressed and hexane free, NOW Solutions’ Organic Argan Oil soothes and moisturizes the skin. This multipurpose oil can also be used on the hair and nails, but I love reserving it for my skin. The ultimate hair treatment, coconut oil is a must-have in every green beauty’s bathroom. Deep treat your hair and scalp with this fatty acid-rich oil, or treat your legs to an incredibly smooth shave by massaging coconut oil all over before shaving. If your facial skin is not sensitive to coconut oil (mine isn’t), you can also use it as a makeup remover. Even my fine, oily hair is in need of some extra moisture from time to time. 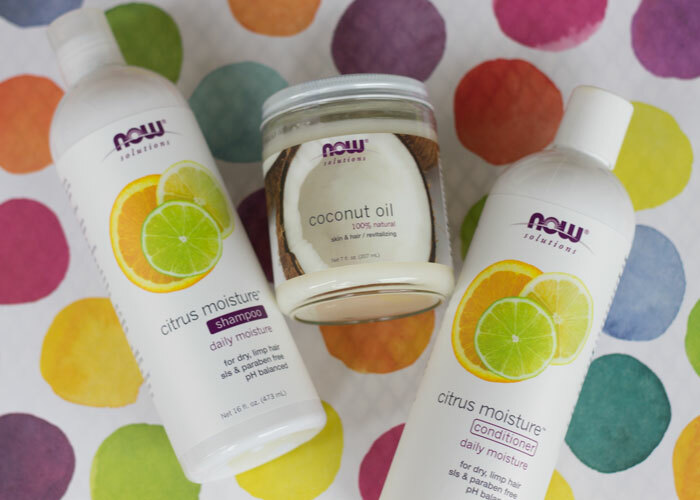 NOW Solutions’ Citrus Moisture Shampoo gentle cleanses, protects and repairs the hair and scalp for an easy, sudsy wash.
What’s a great natural shampoo without its matching conditioner? This lightweight, moisturizing conditioner keeps hair looking and feeling smooth, and leaves it with a soft citrus scent. Another fantastic, multipurpose product for the hair and skin, organic shea butter feels incredible on dry, cracked heels, elbows and any other spot that needs some intense, thick moisture. I also love using organic shea butter on my face when my skin needs a break from various scented oils and balms. My mother, whose had four children yet has zero stretch marks, sings cocoa butter’s praises. This multipurpose butter is best on scars, stretch marks or as a preventative treatment for growing bellies. I love the comforting scent, and use it in a similar way that I use shea butter. 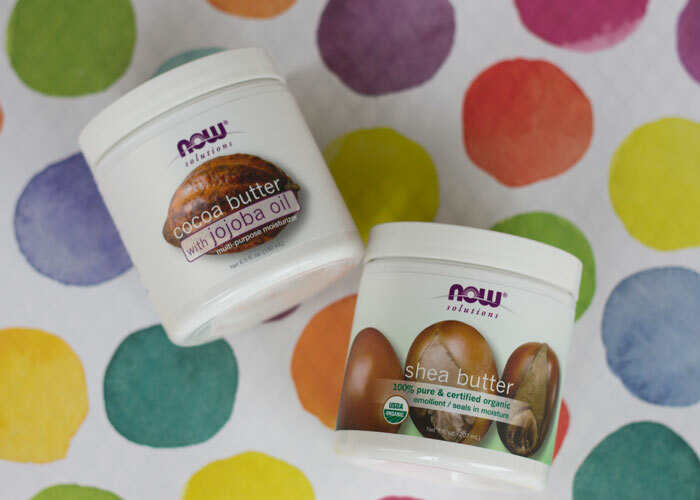 Ready to update your green beauty stash with NOW Solutions? ONE lucky winner will receive all 10 of these amazing products. 3. Giveaway begins Friday, July 10, 2015, at 12:00 a.m. Central Time, and closes on Friday, July 17, 2015, at 12:00 a.m. Central Time.